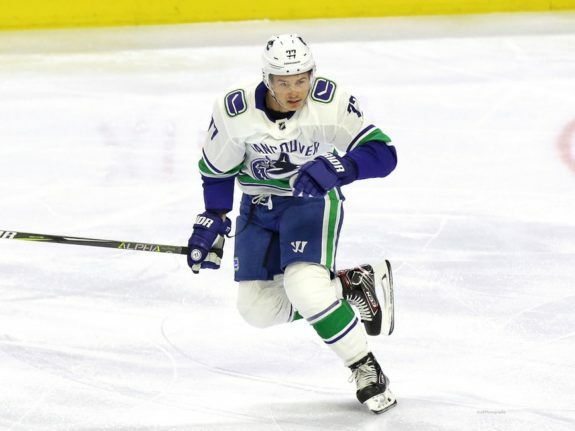 After the New Jersey Devils tied the game against the Vancouver Canucks on Friday night with 6:26 remaining, forward Nikolay Goldobin was benched for the remainder of the third period. The Russian winger received two shifts for a total of 35 seconds in overtime, but has since been a healthy scratch for two consecutive games. If you look at the goal against (below), it’s clear Goldobin was lost. Stefan Noesen goes right to the net and Goldobin (top left of the screen, number 77) doesn’t seem to be aware that it’s his man. He’s just left ‘covering’ empty ice and doesn’t even react until after the puck is in the net. There has always been tension between ‘Goldy’ and Canucks head coach Travis Green. In November, when Goldobin recorded 12 points in 14 games, Green publicly stated that he needed more from the forward on the defensive side of the puck. Since November ended, Goldobin has three goals and just 11 points in 34 games, and Green said he needs more scoring from him. ‘”I think he has two goals and two assists in 23 games. You have to bring something to the table,” Green told TSN’s Jeff Paterson on Sunday before the team’s shootout win against the Dallas Stars. “Those aren’t really numbers that are going to keep a guy in the league. We’ve challenged him and I think he’s gotten better in certain areas, but at the end of the day, you have to do something that helps you win and helps you stay in the league. We know he’s not going to be a guy who’s heavy and hard and physical and I know that and I’m alright with that. It sure doesn’t seem to me like Green is a fan of Goldobin. Because of the comments — which include saying his numbers aren’t even good enough to stick in the NHL — it’s clear his time in Vancouver is just about up. Green’s point about the team needing more offence from Goldobin is clear as day. Four points in 23 games is atrocious. Since Jan. 1, defenceman Alex Biega has more than twice as many points (nine) as Goldobin and more shots on goal in two less games. And it’s not like Goldobin has been buried on the fourth line, hasn’t been given power-play time or hasn’t been starting shifts in the offensive zone. None of those have been the case. 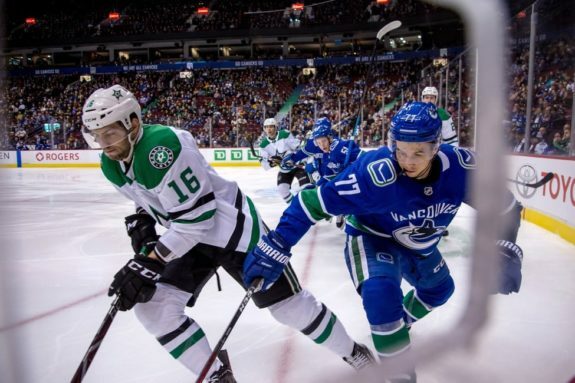 Goldobin has skated a total of 730:04 at 5-on-5 this season, and 81.1 per cent of those minutes he was being centered by either Elias Pettersson or Bo Horvat. 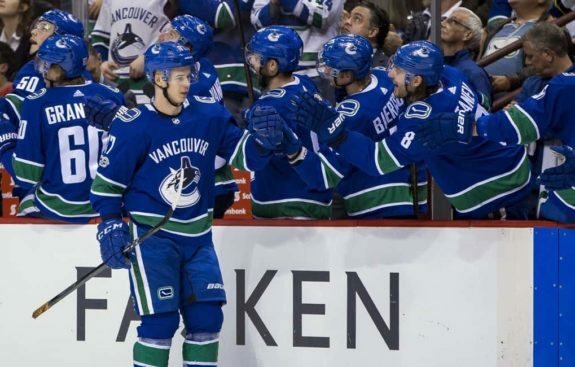 When he was in the lineup, Goldobin received an average of 2:34 of power-play time per game, behind only four forwards: Pettersson, Horvat, Brock Boeser and Josh Leivo. His offensive zone faceoff percentage of 62.81 is the third-highest of forwards on the team with at least 450 minutes played. Despite those opportunities, he has produced six goals at 5-on-5 in 62 games and his 0.34 goals per 60 minutes on the power play are the second-worst of all Canucks forwards. 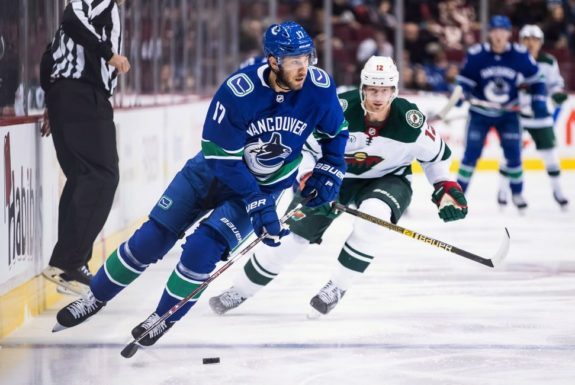 Because of these poor numbers, TSN 1040 reporter Farhan Lalji, who co-hosted the Sekeres and Price show on Tuesday, agreed with Green’s decision to bench Goldobin, even though he didn’t agree when he was scratched earlier in the season. I actually like it. I’ve kind of been one of those early on in the process that said ‘Let this guy play’. I think you give up a little bit defensively, or you’re willing to give up a little bit defensively if he’s producing. You’re willing to let some stuff go if there’s an offensive pay-off at the end. Clearly there hasn’t been here. For those who say Goldobin is simply not a goal scorer and more of an assist man (a fair point), his 0.82 assists per 60 minutes this season rank fourth on the Canucks but 254th in the NHL, tied with Tomas Nosek of the Vegas Golden Knights. Goldobin’s 1.31 points per 60 minutes rank 267th in the NHL, behind Cal Cutterbuck of the New York Islanders (both for players with a minimum of 500 minutes played at 5-on-5). While I do think Green’s comments are contradictory, he’s not wrong that it’s tough to play someone who’s not producing and also struggles defensively. As we’re about to see, Goldobin’s defensive numbers have also gotten worse as the season has gone on. I don’t think Green really meant it when he said he thought Goldobin has gotten better in certain areas of his game. It’s clear he’s been a defensive liability all season long, and since December, it’s gotten worse. On the season as a whole, with Goldobin on the ice at 5-on-5, the Canucks allow 30.98 scoring chances against per 60 minutes. That is the worst rate of all Canucks forwards with a minimum of 450 minutes played. When he was producing offensively, that number was lower: it was 28.83 in 28 games from the beginning of the season until the end of November. Since Jan. 1, that number has jumped to 29.49, second-worst on the Canucks, but also 46th of 327 NHL forwards who have played at least 250 minutes since Jan. 1. Goldobin’s 33.33 goals-for percentage at 5-on-5 is also second-worst on the Canucks since Jan. 1, as he’s been on the ice for just seven goals for and 14 against. His 25 giveaways at 5-on-5 this season are also the third-most on the Canucks. The Canucks constantly allowing more scoring chances and more goals with Goldobin on the ice this season is one thing, but couple it with a lack of any offensive production whatsoever and the conundrum facing him becomes clear. His 26.3 scoring chances for per 60 is third-best on the Canucks this season, meaning the chances are there, but that’s worth zilch right now if nothing is going into the back of the net. TSN hockey analyst Ray Ferraro said it best on Tuesday afternoon with Matt Sekeres. When a guy is scoring…the coach will look for more expanse of his game: all the little things that you just touched on. When he’s not scoring, well then he’s not scoring. Because he’s not doing enough of the other things anyway. It becomes a real conundrum for a point producer because you’re not built, in most cases, to do enough of the other things that other people do, so you have to score and if you don’t score, then you’re stuck. Ferraro added that he’s not a fan of the ‘complete player’ cliche because, “in most cases, a 200-foot player means somebody that can’t score. If you look at the season as a whole, Goldobin can’t defend and he can’t score. Green’s patience has run out. So, now what? The on-ice results with Goldobin are bad, both offensively and defensively. That being said, he should not be sitting in the press box. Goldobin will be a restricted free agent on July 1. Before then, you might as well play him (with good players, too) to try to maximize his trade value before the NHL Entry Draft, when you might be able to swap him for either a low draft pick or a struggling prospect on another team who needs a change of scenery. Remember the cost to acquire Josh Leivo? I’d say that worked out pretty well. Even better, what if another team with cap issues likes what they see in a cost-effective 23-year-old playmaking winger, and is willing to take on Loui Eriksson’s contract to get their hands on Goldobin? It will surely, surely take more than just Goldobin to get rid of Eriksson’s terrible contract, but it could be a bit of a sweetener for the right team. Green’s actions and his comments make it pretty clear Goldobin will not be qualified this offseason. Whether you’re a fan of the player or not, letting him go for nothing is not a good scenario. Even if all you get for him is a fifth or sixth-round pick, it’s better than nothing. It’s about time general manager Jim Benning learned a thing or two about asset management. *All advanced stats in this piece not already directly credited courtesy Natural Stat Trick.